It’s inevitable. We’re naturally creatures prone to worry. We worry about our kids, we worry about our family, we worry about our friends, about what’s going to happen. We worry what other people think of us, say about us, or feel about us. We worry that we’re not doing a good enough job. We worry that things won’t turn out the way we want them too. There’s no shortage of things to worry about, right? It’s an endless stream of options because worry always resides in the future and since the future is uncertain and hasn’t happened yet, we’re just gonna keep on finding something to worry about in the meantime. There’s an endless supply of things to worry about. If you turn on then news in a matter of minutes you’ll be offered up a plateful of even more potential worries that you hadn’t thought of on your own so now you have your own worries and all these other things swirling around in your head, expending your energy draining you both mentally and physically. Here’s the thing with worry, it’s not useful. It doesn’t help at all and it feels terrible. It feels productive like we’re being busy in our heads but it’s only our mind spinning thoughts, nothing actually productive is taking place. Problems and challenges aren’t being solved and you’re still not feeling any better, in fact, you’re probably feeling worse and really, about what? Something that hasn’t even happened yet. It’s a potential problem. What do you worry about? Think about this, have the thoughts you allow to spin and loop in your head actually helped or contributed to finding a solution or peace to your problem? Or did the perceived problem actually happen? Most likely, it’s a no, right? But it feels like you’re actively doing something when sometimes nothing can be done. We so want to be doing something, to contribute, to help, to move things forward and sometimes you just can’t so you worry. It feels busy. It feels like you’re moving, like you’re doing something but in all actuality, you’re just spinning on a hamster wheel, running and running and running until you wear yourself out…and you’re still not anywhere closer to a solution yet. My daughter had minor surgery this past week. When we talked about it to others they immediately started to worry for us. Are you okay? Are you worried? Then they’d start in on all the potential problems that could happen, and not in an ill manner whatsoever but well intended, I’m sure. No, we were not worried. Yes, complications could happen. If they did, we’d tackle them then. But until that point we chose not to worry. There currently wasn’t a problem and there was no use expending all that extra energy on something that hadn’t even happened yet. But how often do we do that to ourselves? Whether it’s a conversation we feel like we need to have or want to have. But we’re worried because we don’t know how the other person is going to respond. So in our minds we think of all the worst possible ways they’ll take to the conversation and we create this miserable present moment for ourselves creating a problem NOW instead of just a potential problem in the future. We’re wasting our present moments indulging in worry and negativity now. What about losing a job? You have an actual problem that needs an answer and solution to but we make it even more challenging to solve because we’re too worried about the future and the potential problems that we could face if you don’t get another job. So instead of spending the time on useful emotions and energy, we end up draining a good portion of it in our thought loops feeling like we’ve been very busy and productive when in reality we haven’t, or haven’t been productive in solving the present moment, the current circumstance. We worry that people won’t like us, that we won’t be accepted. But we don’t know if they will or they won’t, right? So we worry about a potential problem feeling terrible all the while you could be enjoying the present moment and attracting people to you instead of worrying that they won’t accept you. Most of the time too, it doesn’t end up being a problem at all. How many times have you felt so relieved because it didn’t turn out to be a problem at all? Like, Phew! I thought she was going to be so mad at me and she wasn’t! She was actually really cool about it. And then you feel this huge weight off your shoulders and you’re giddy and light. But you didn’t stop to even think that that weight didn’t need to be on your shoulders at all in the first place. There wasn’t a problem to begin with so why did you create one? Here’s the thing, your brain is actually always looking for a problem to solve. Always. It’s always working to solve something and if you don’t deliberately give it a problem to solve it will find or create a problem to solve. Most of the time you won’t like what it chose to focus on either. So if you think the thoughts like, “what if…” in a scared or worrisome tone you’ve just given your brain a problem to solve and it’s going to take the problem with the tone of, this is a problem, this is not good, it’s going to give you answers and evidence that this is not good, this is indeed a problem and here’s why. Then you feel worried even more because now you have other thoughts and perceived evidence to back it up. Last year we found a house that we just fell in love with. We weren’t planning on moving but when we saw this house we just really felt strongly that that was our home. We prayed about it and felt right so we proceeded forward with it. We had complications along the way that triggered doubts and worry within me. For one, I worried because our house wasn’t in sellable condition. We were in renovation mode and several projects weren’t finished. I worried because we didn’t have a whole lot of time to make it sellable and finish the renovations. I worried that our house might not sell and then what? I worried that people wouldn’t like it. I worried about how I was going to homeschool four children and have it ready on a whim each time the realtor would call. I worried about what to cook for dinner because I didn’t want lingering broccoli smelling up the house and deterring people from buying it. I created worry by thinking of all potential problems and “what if’s” without actually stopping to answer any of them. I just left them dangling and looping again and again starting and restarting the cycle of perpetual worry and anxiety. I wanted to feel better but because I didn’t have proof that things were going to work out I just used that as more evidence that maybe things wouldn’t work out and oh no! What then?! I worried because I used the past as evidence that my worry was indeed legitimate. See, another open house and no offers. It’s probably not going to work out this time. So you worry and worry about this interaction, how she’ll react to the news, what she’ll say to you, if she’ll be offended or not. all of this instead of turning your attention to how YOU want to feel and what you want to do about it. Several people that I work with worry about what other’s will think of them. They worry that they won’t measure up in some way. They worry that people will judge them, think less of them, or talk about them to others. They worry they’ll feel rejected, less than, or unworthy. Worrying leads to all all kinds of negative things, like, superficial actions – maybe you start doing something, saying something, pretending to be someone you’re not because your too worried that people won’t like you if you’re just you. Worry sometimes leads to embarrassment, missed opportunities – like not doing something you really want to do because you’re afraid of what others will think of you or other potential problems – what if they think I sound dumb? What if they think I don’t know what I’m talking about? 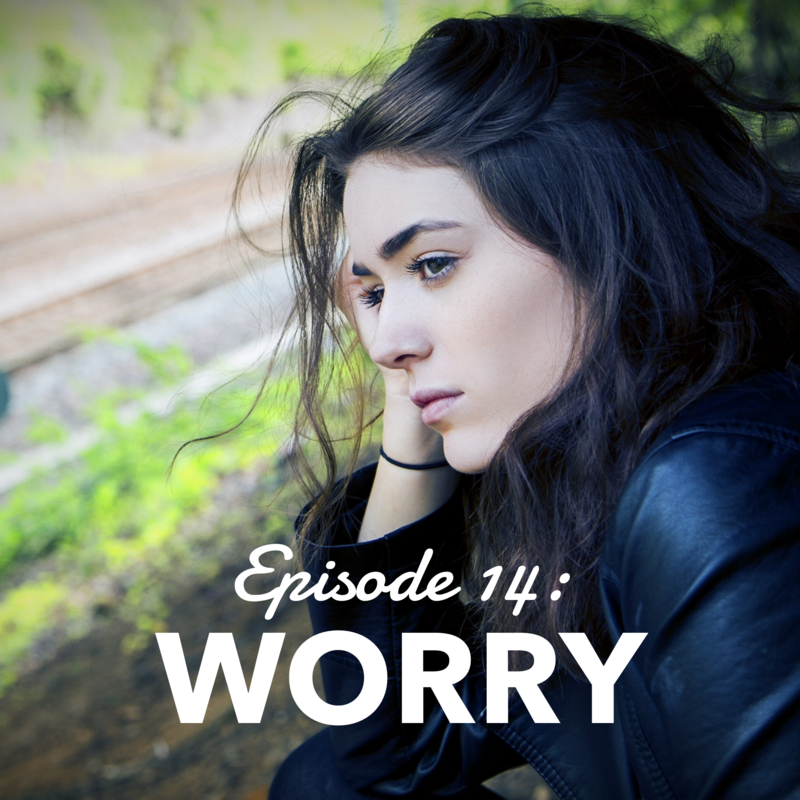 Worry can also lead to regret, regret of actions not taken, words not said, and outcomes that won’t happen now because instead of pushing forward you remained silent or small, and time after time of doing this, not doing, not saying the things you really want to for fear of potential problems can lead to bitterness. Bitterness for yourself for not being authentic to you and bitter towards others because you then blame them for how you’re feeling. Worry. Worry is it’s own problem that causes all kinds of potential problems. Too often we assume worry is just a given. Like, of course I’d worry. My daughter is sick so naturally I’m going to worry. I just got a call from the stake president, ah! What does he want? Of course I’m going to worry. I just sent a pretty straight forward text, yeah, totally worried about how they’re going to react to it. But worry isn’t a given. It’s not obvious and it certainly doesn’t HAVE to be your go-to. It’s optional. Worrying pretends to be necessary. It drains your energy and takes you out of the present moment and into a future you can’t control. It feels like you’re doing something, it feels like you’re being productive and busy but you’re not going anywhere. You’re just running and running and running on that hamster wheel and the only thing that’s happening is that you’re worn out. And that’s the thing. It’s all in the future and when you’re trying to live in the future and looking at all possible potential problems you’re missing your present moment. You’re all closed off to possibilities that things might turn out perfectly. In fact, they always do. Things always turn out perfectly. I know, you’re wanting to argue with this. It wasn’t perfect that my husband lost his job and now we’re worried about how we’re going to make ends meet. How is that perfect? How is it perfect that my sister in law didn’t call me and I’m worried because I feel rejected? How is it perfect that my child is sick, really sick? Those are wonderful questions. Questions that for sure, have answers, ones that when you’re open to receiving that revelation you’d probably agree that it’s exactly what you need. But when you’re focused on the wrongness of it. The unfairness of it. You miss the opportunity to see how that actually was perfect for you and your family. But to be able to see any of those possibilities you have to first realize that what’s happening IS perfect for you. It’s exactly what you need right now. It’s always for your benefit. This is very comforting to me. It helps me to realize that I really don’t need to worry. Especially about things that haven’t even happened yet. So instead of jumping to the negative and thinking, the world is going to end – like our primitive brain likes to jump to, you can entertain the thought that this might be exactly what’s supposed to happen. What’s happening is exactly what I need to experience. Then be really clear to stay in the present. You’re not starving right now. I hadn’t lost the house at that moment. Things are always okay in the present moment. Stay there. Doing this helps you access brilliant insight into all the possibilities that are open to you. How is this perfect for you? Or I like to even ask myself this question: How am I perfect for this circumstance? Then you’re focusing on your strengths and why you are the perfect candidate for what’s going in your life. It also shifts your energy to the positive instead of the negative. What if there’s an even better house for us? What if this is what it took to get our current house exactly like I wanted it? We’re too quick to want to change our circumstances. If it starts to feel even the slightly uncomfortable we’re like, “that’s it. I’m out.” Fix it. Change it. Don’t like it – the world is going to end. This isn’t okay. We don’t even give the current a circumstance a chance to love it. How freeing would it be to look at every single circumstance that comes your way and think, “Come what may and love it”? Instead of fearing the future and potential – not guaranteed problems – you just decided that you were going to love whatever came your way. Think about that for a moment. It is possible. It’s amazing. There’s a great amount of faith involved in living this way and faith, we read, “moves mountains” right? I love this because I don’t know why things happen the way they do. I don’t need to know. What I do know is that God, our Heavenly Father LOVES His children. I know that He would never do anything that wasn’t for our good. That wasn’t absolutely necessary for my growth and progression. Remember when you start to worry and think about things in the future that haven’t happened and might not happen that is is possible to stop. It’s possible to interrupt those thoughts and deliberately choose a new path. I love interrupting those thoughts with thoughts of love. Love feels best. You show up as your best self when you’re coming from a place of love. You create the best results for yourself when you’re showing up and acting from love. Do something about it. Stay in the present. Don’t allow yourself to spend anytime thinking about what could go wrong and focus all your energy on living and loving this moment right here, right now. Then look to the future with optimism. This isn’t resisting those thoughts when the come. I’m not closing my eyes and pretending to be happy. That’s not what I mean. Notice how you’re feeling. Name the feeling. I’m worried. I’m feeling anxious because I’m worried. Then be curious about it. How do you feel when you’re worried. What does anxiety feel like in your body? Be super descriptive. Allow it to run the full cycle, which you’ll remember from Neuroanatomist, Dr. Jill Bolte Taylor is a 90 second cycle. You can feel it for 90 seconds. 90 seconds is nothing. You can feel just about anything for 90 seconds, right? After that it’s a choice – it’s optional if you’ll re-loop that thought and re-start that cycle again. So for 90 seconds describe it. Feel it. Notice where it runs through your body. Distance yourself from the original thoughts creating it and then in that clean space that’s when you decide that worry isn’t necessary. It’s not needed, required, or wanted. It’s not helping anything. It’s not productive. It’s an energy drainer. That’s it. How DO you want to feel? How can you see this is as perfect for you? How are you perfect for this circumstance? How can you LOVE it? Those are great questions that opens you up to receive great insight, personal revelation, and answers that will help you and inspire you to show up as your best self. Let me fill you in on what happened with me and my house worries. After weeks and weeks of worrying, resisting, and running on my hamster wheel I finally decided that I was going to love whatever happened. I asked myself all those questions that I offered to you and felt amazing about it. I got to the space where I loved the option of staying home and I loved the option of moving. No matter what it was going to be perfect. I felt amazing. I felt relieved. I felt peace. The night before the offer would expire our house sold. We didn’t get just one offer but two and another on the way. Miracles happen when we’re open to believing them. We’re too bent on our own cottage sized understandings that we block the possibility that we could have a palace, be made into something bigger, greater. That we are capable of so much more. That you’re supposed to be a beautiful palace. Trust Him. Trust the process. Come what may and LOVE it. You can do it. Have a great week everyone!